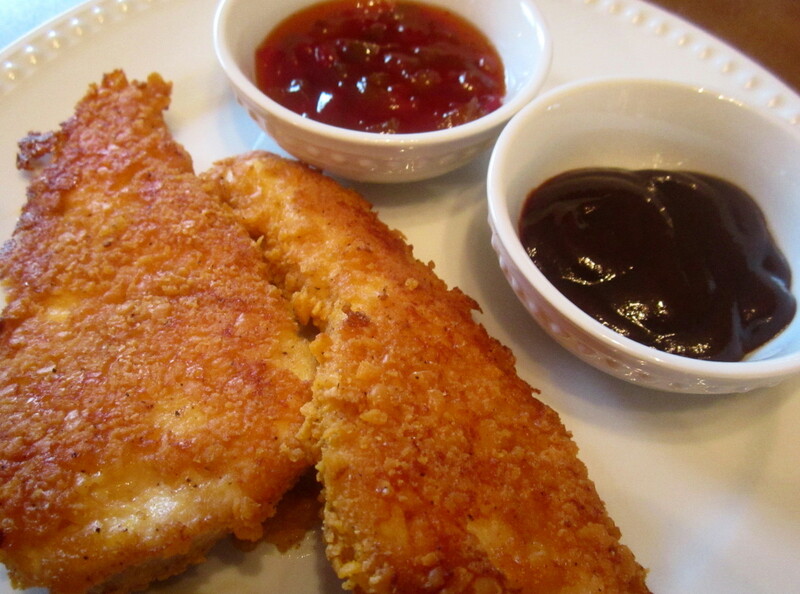 This Goldfish Breaded Chicken from Just a Pinch.com looks crispy-crunchy-AMAZING. The idea of cheddar hints and goldfish goodness in a crackling chicken crust? Wowza. My only hesitation, though, was from a health standpoint. Those crackers, while half past incredibly tasty, aren’t necessarily the best thing for you. Could that affect the healthiness of this recipe, too? Image sourced from makeawhisk.com. Check out that cheese sauce! Image sourced from Tasteofhome.com. Mmm. Come to mama, my little bowl of chicken. 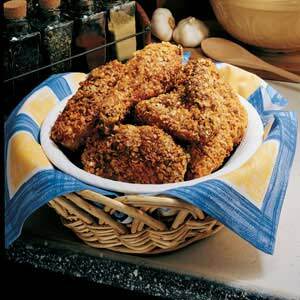 Italian Oatmeal-Breaded Chicken — serves 4; easily doubled or halved. Preheat the oven to 400°F. Prepare a baking sheet with either a silicone mat or by spraying lightly with Pam or other cooking spray. Set aside. If using chicken breasts, dry them with a paper towel. Then, cut into tender-sized strips, about 1 inch in thickness. You should end up with around a dozen chicken “tenders.” If using pre-packaged tenders, simply open the package and dry with a paper towel. In a food processor, grind the oatmeal until it becomes a fine powder, or flour-like; if you don’t have a food processor, place the oatmeal in a plastic bag and “crush” using a meat tenderizer. If you end up with larger pieces of oatmeal, whatever. No biggie. 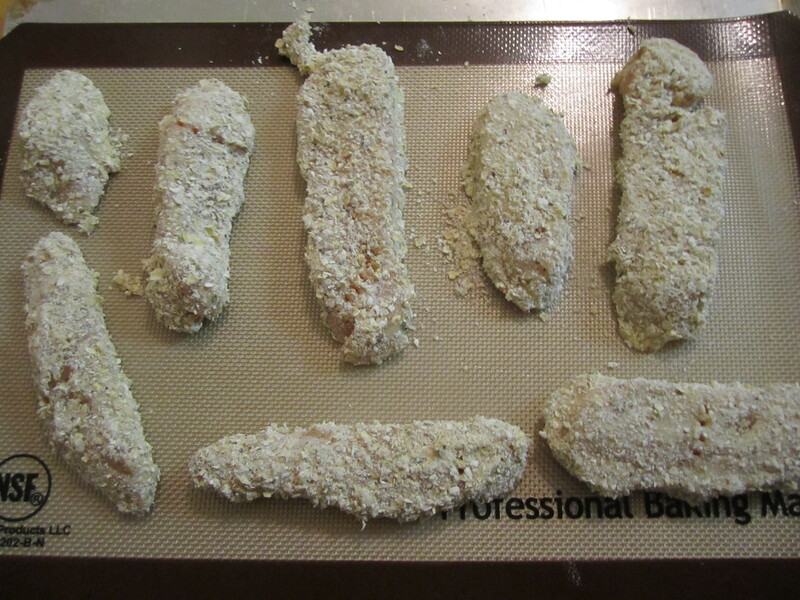 This was my attempt at making the double-breading ingredients into modern art. Success? Bowl 1: wheat flour, garlic salt and black pepper. Mix together lightly with a fork. Double-bread each piece of chicken: First, dredge chicken in the flour mixture, shaking off the excess. 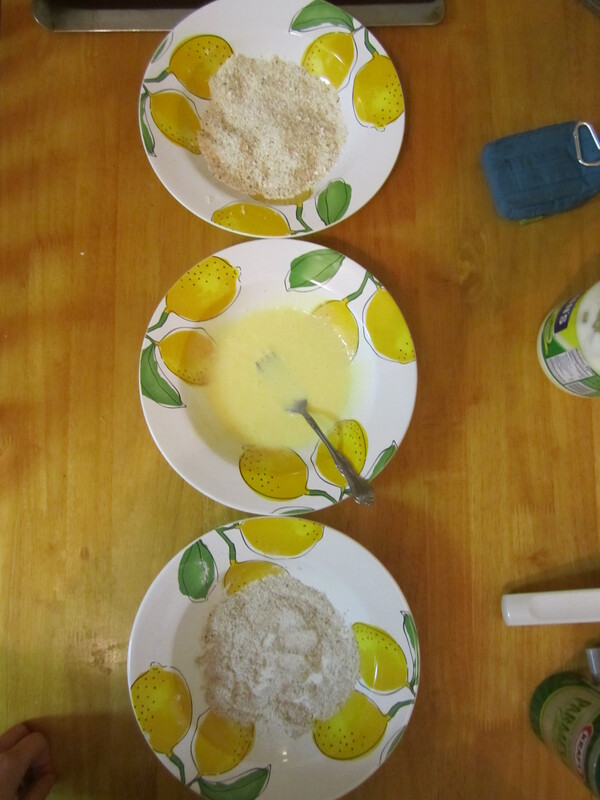 Then, dip into the egg-mayonnaise mixture; you can use a pastry brush to help coat each piece if the mixture’s too thick. Finally, coat in the oatmeal-cheese-herb mixture, and set on the baking sheet. Repeat with each piece of chicken, arranging them 1-2 inches apart. Don’t they look purdey? And this is just from one chicken breast. Bake for 20-25 minutes, or until chicken is cooked through and juices run clean. Optional: Broil for an additional 3-5 minutes if the coating isn’t browned to your liking. The end result? Delicious. 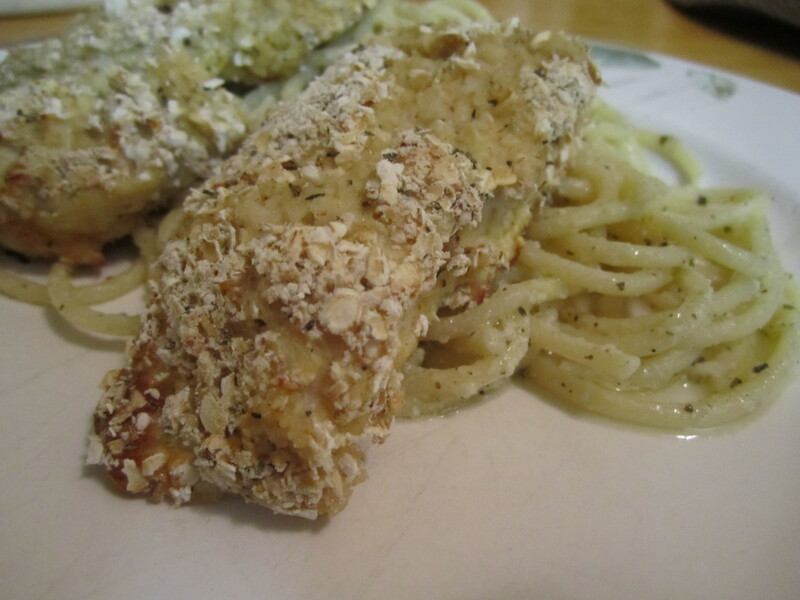 You can rest easy knowing you’ve had your breaded chicken without any of the “guilt.” I’d even serve this tasty dish over a salad, a bed of cooked spinach, or even cut into chunks and stirred into a tomato-based pasta sauce. Chicken-parm-pasta? Yes, please! Happy eating! 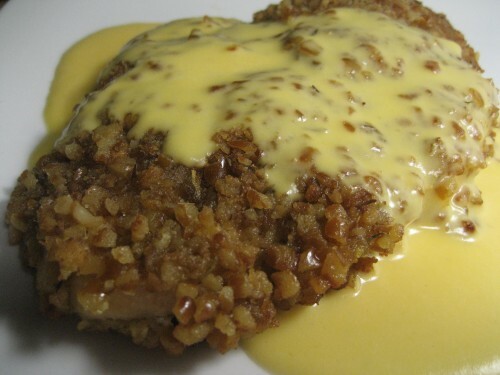 What are your favorite coatings for chicken? Anyone tried the goldfish or pretzel recipes, or even something else? (Say, oyster crackers? Saltines? Potato chips, even?) Let’s get creative, readers: What’s up your sleeves and in your recipes? I like Asiago cheese mixed in the coating. I’ll have to try the oatmeal, that sounds great. I like parm. cheese with italian spices also. I always like chicken recipes, keep up the good work. Thanks! And I hadn’t thought of Asiago, but it’s such a delicious cheese. Thanks for the idea!